The GP Curriculum Guide gives a core training module designed for both Clinical Supervisors and GP Specialty Trainees. It provides specialty specific curriculum descriptors for the different clinical departments who undertake GP training and is intended to be a resource used jointly by supervisors and trainees for initial placement discussions, clinical supervision and PDP planning. The GP Curriculum Guide is based on the GP Trainees in Hospital Placements created by Scotland Deanery South East Region. In order to access any e-LfH programme, you will need an e-LfH account. If you do not have one, then you can register by selecting the Register button below. 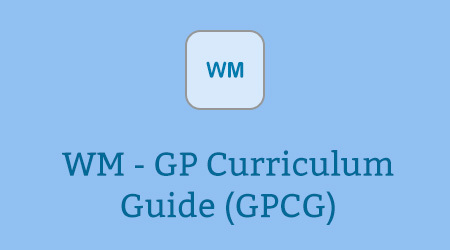 If you already have an account with e-LfH, then you can enrol on to the WM – GP Curriculum Guide programme by logging in to the e-LfH Hub, selecting My Account > Enrolment and selecting the programme. You can then access the programme immediately in the My e-Learning section.